My sister and I had a booth at the Berlin Village Fair last weekend. We had a lot of browsers, a few sales and a custom order! 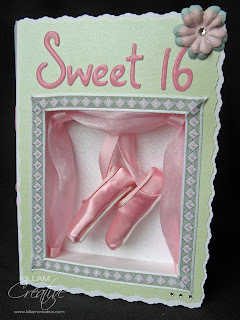 Here is the Sweet 16 card I made for a ballerina. 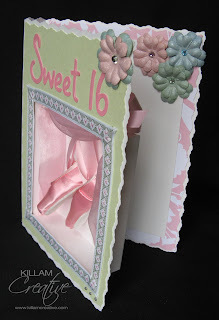 Her aunt described her as very girly, loves pinks, does ballet, and a few other key things that helped me design this card. 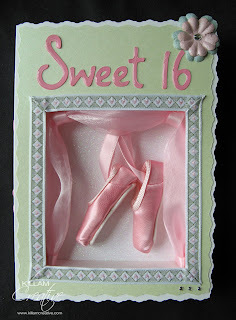 I knew I wanted to make pointe shoes, and the size of the shoe dictated the size of the finished card. This was a blast to make, especially since I had a specific person in mind. I delivered it to the clients yesterday and they were so thrilled. Husband is a professional videographer and had Wife and I sit for a little interview. They are a nostalgic family and wanted their niece to "meet" the artist who made the card and have a keepsake video for years to come. I was surprised with the interview, but didn't do too bad (I think!). At least I didn't get flustered and flushed. They will send a copy of the video, so we'll see! 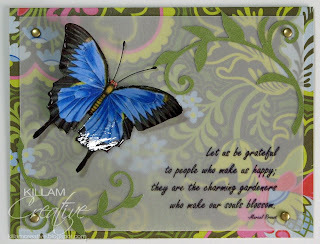 The butterfly is a vintage image printed on heavy cardstock. 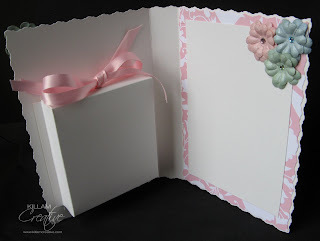 I inked the edges black and applied Glossy Accents to the top and also used it to adhere to the vellum. The antennae are a combination of black jewelry wire, glue and black glossy acrylic paint. I printed the sentiment on vellum (and let it dry for a looong time) and used gold brad heads as accents.